Pinned blades 127mm (5") for a scroll saw. The blades are manufactured to be used with scroll saws. There are various blade types available in the range with different teeth styles for different uses. 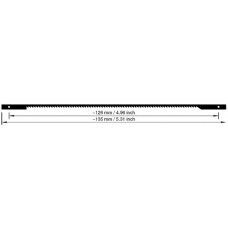 A minimum pilot hole of 4.7mm is required for cut-outs. Take a look at the chart below to select the correct blade for the recommended material and thickness. Some blades have reversed teeth for fast paced cutting. Take care when using these blades as the blades can lift up your project from the scroll saw table when cutting.